“Charles made it as painless as it could possibly be considering the reason for needing his services.”Laurie E.
“Great service at reasonable price. Level headed and helped for follow up.”Jean P.
“Very professional And great experience.”Angela H.
“Charles did a great job helping us through this difficult time. He is both professional and friendly. We are very grateful to him 4 his assistance. I would recommend him to any other couple who seeks to mediate their divorce without having to deal with nasty lawyers and expensive ones as well. His years of experience and intelligence shine through all of the day we spent with him. 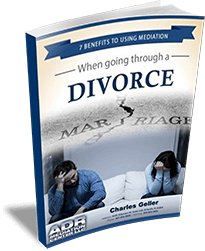 Thanks again, Charles.”Ken N.
“I would highly recommend Mr. Geller and mediation in general as a very easy way to end a marriage if both parties are in agreement to the terms. It saved a lot of headaches and money. He is a very down to earth mellow guy who met with my wife and myself at the same time, at the same table and helped us thru the process very professionally. Way better than lawyers and fighting each other.”Darren K.
“Mr. Geller was very professional, and easy to work with. Made the process as painless as possible. Recommend his services if needed.”Nise N.
“Charles brought some peace to this very painful experience.”Meg S.
“My experience with ADR Mediation (Charles) has been Great! Charles is very professional, understanding and fair. I highly recommend his services to anyone in need of a Mediator.”Alexandra D.